Joe: I have to help Charles finish his movie. 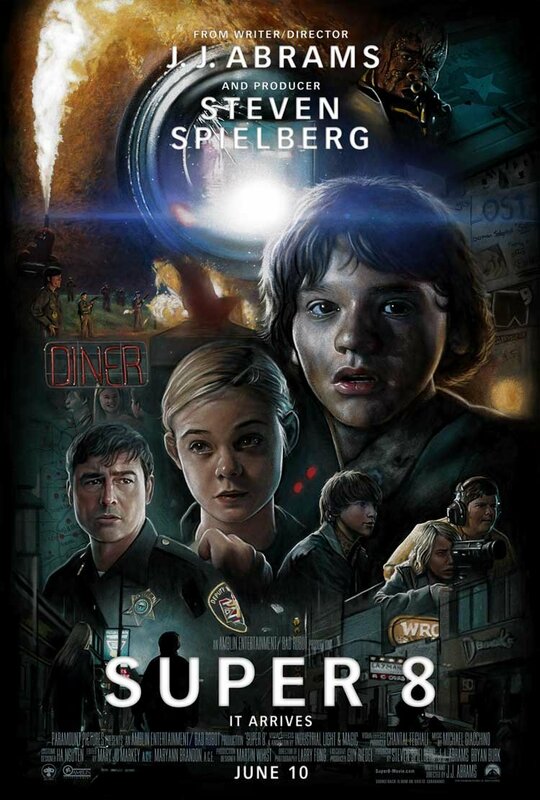 Before the J.J. Abrams directed film, Super 8, begins, the film is stamped with the Amblin production logo. Amblin is a production company created by Steven Spielberg back in 1981. When that logo began to appear on the outset of not only Spielberg films, but films directed by other filmmakers he had influenced, it would imply that the film would fall into a particular category that holds a sense of wonder that could skew towards all audiences. 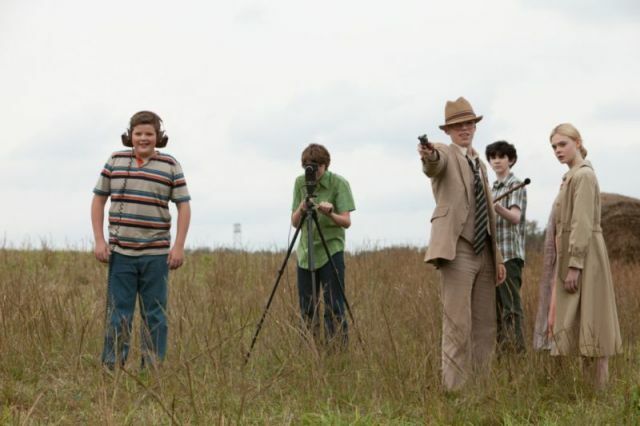 Super 8, which has Spielberg on board as a producer, certainly evokes elements of films like E.T, Gremlins. and The Goonies, but is also a product of modern cinematic sensibilities. 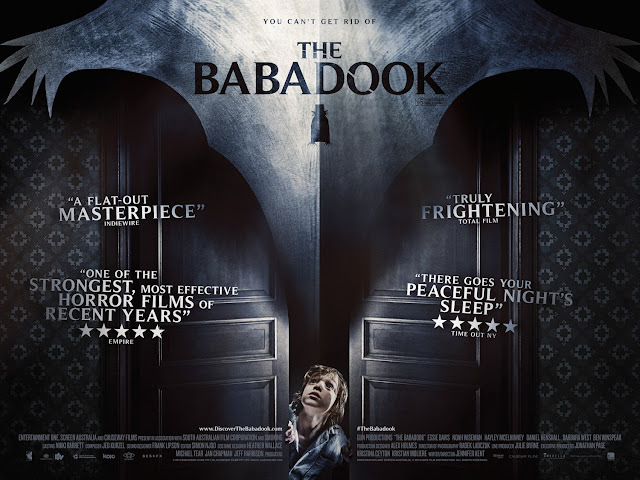 The film has some trouble striking its balance between being a throwback adventure and a modern thriller for (almost) all ages, but it is a very enjoyable feature. There is a nice level of nostalgia that works for this original summer blockbuster. As with the admirable marketing campaign, I will tread lightly in describing the story. Set in 1979 small town Ohio, the film revolves around a group of middle school kids who get way more than they bargain for, after simply wanting to make their own zombie movie. 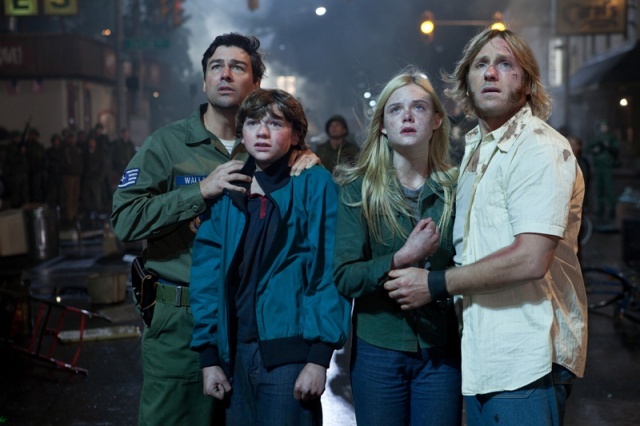 Let me back up, we meet our hero, Joe (Joel Courtney), as he mourns the death of his recently deceased mother. Joe and his father, Deputy Jackson Lamb (Kyle Chandler), have not had the best relationship, but are now stuck with each other. Four months later, school is out and Joe’s best friend Charles (Riley Griffiths) needs help from his friends to finish his monster movie for a film festival. Charles has also managed to add a girl to the group, Alice (Elle Fanning), which provides them both a female lead (yay for the boys!) and her father’s car (yay for transportation!). Joe, who develops a crush on Alice, is of course on board to help with Charles’ production. After sneaking out late one night, the boys and Alice head to the local train stop, in an effort to film a scene on location for good, “production values,” as Charles puts it. While filming, a catastrophic train collision occurs, which has the young filmmakers running and dodging for their lives. Following the destruction, it would appear that this particular train may have been holding some classified cargo, which has now gone missing, prompting military involvement. Luckily, Charles’ camera may have been recording enough of the truth for the kids to figure things out for themselves. Whatever the case may be, this small Ohio town may become a big center for a lot of thrilling activity. Dr. Woodward: Do not speak of this. If you do, they will find you. I have not hid the fact in any way that Super 8 has been the film I was most anticipating this summer. 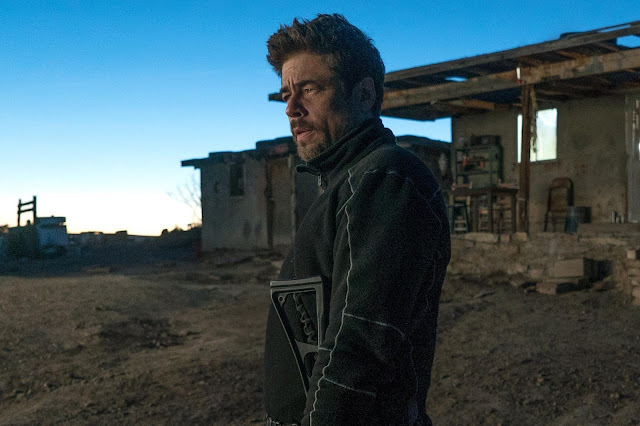 It was easily a way to set myself up for disappointment, and while I do not think the film lived up to my ridiculous expectations, I do think it is a very good film, with some really great moments. An easy way to define the positives and negatives is by saying the acting is quite good, particular from a cast of young actors who are mostly newcomers. I can also acknowledge how great the sense of wonder and mystery held throughout the majority of the film is. 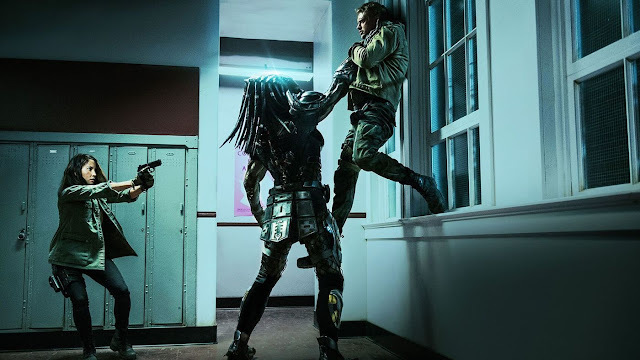 However, I also think the film suffers from being a bit scatterbrained about handling the thriller elements that dominate the third act, which hampers some of the emotional beats. In an attempt to continue to not spoil this movie, which I do believe should be seen on a big screen, I’ll simply say that the effects driven aspect of the film does not flesh itself out as much as the affecting side of the living-flesh characters (now that’s wordplay!). Writer/director J.J. Abrams has become one of the busiest men in Hollywood, having been responsible for producing TV hits such as Lost and Alias, and directing Mission Impossible III and Star Trek. 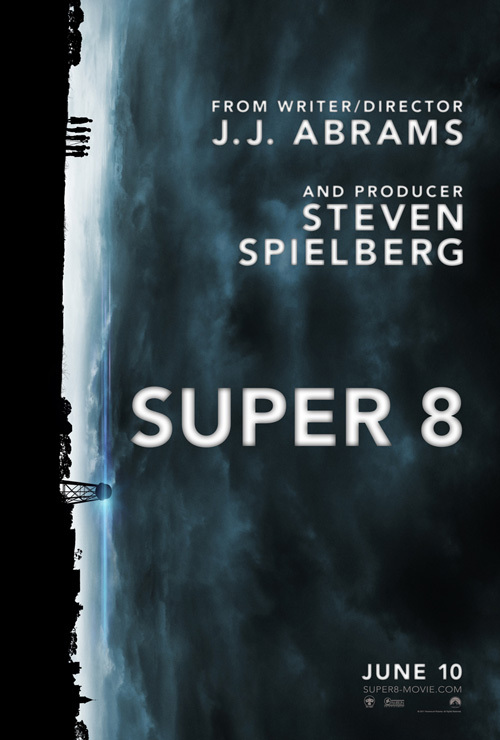 Super 8 is the kind of personal project that I am certainly happy he was able to make. Being one of the many people to have been mentored by Spielberg, Abrams does have a lot of high regard for that late-70s to mid-80s period, where many Spielbergian films exist, and does a refreshingly good job at capturing a lot of that same kind of charm. It is in the discovery aspect of the film where it shines the brightest, as the natural chemistry of the kids dominates the screen and the adventure aspect creates a very watchable and mysterious atmosphere in a fun way. And in true movie geek fashion, Abrams has a lot of fun paying homage to a lot of those classic films in many ways that range from names, to camera shots, to the very John Williams-esque score that is provided by the wonderful composer and frequent Abrams collaborator, Michael Giachinno. 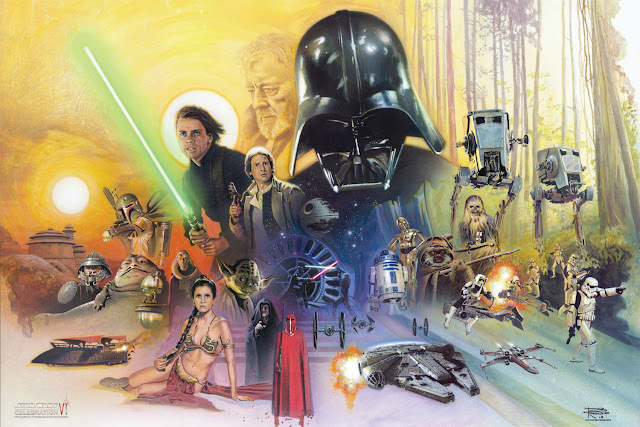 The story and characters are both some of the film’s best aspects and the leading cause of some of its problems. There is an endearing quality to all the kids, but I particularly enjoyed newcomer Joel Courtney as Joe. He has the right amount of screen presence that makes him a good anchor between all of his friends. He also has the kind of sincerity that lends itself to the important character points in the film. I have to also praise Elle Fanning, who is very good as Alice, doing well with some particular plot points that have her and Joe entwined on multiple levels. Kyle Chandler is also good with what he gets to do, but this leads into some of my problems. Sticking close to the blueprint of past Spielberg films, the troubled family quality of this film should have made more of an impact than it does by the time this film ends. Tough without spoilers, but suffice it to say that the uneven balance of the film does not quite lead to a stronger emotional payoff by the time this film ends. 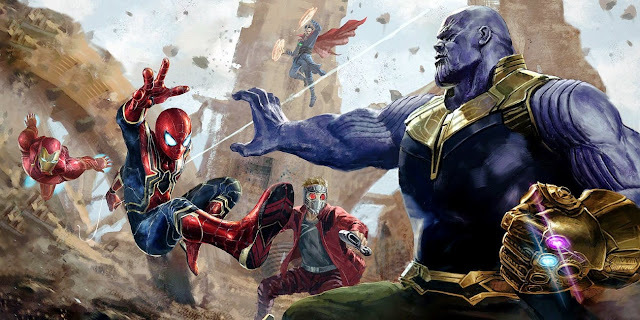 It is a problem that is due to the overall balance of the film, which arrives at its third act with too many ideas and plot threads, without a better conclusion in store for the audience. Getting back to the praise that this film does deserve, Abrams goes the Jaws route in how he gives the audience just enough to keep them curious and have the tensions running high. The game of show and tell is always tricky, but this film does a very good job in the way it reveals more and more of the danger element. The film has its share of jump moments that are well crafted and are also balanced by a nice amount of levity. A huge level of excitement comes from that train crash at the beginning, which is a great “awe” moment as far as killer set pieces go, regardless of what kind of logic could really result in destruction of that magnitude. I must add that in getting to the scenes that involve the film’s “threat”, Super 8 does seem to push the PG-13 pretty hard for a film that I would have thought to skew a bit friendlier. A lot of the excitement surrounding the hype leading up to Super 8 has been in regards to placing it in the higher realm of films already considered classics (or at least childhood treasures). There should be something flattering about that, with people wanting to praise the quality of a particular era movies and wishing this film to fit right in there. It helps that the marketing has done a very good job at evoking a specific feel in advertising this feature. However, films do not become instant classics and Super 8 is not flawless. For these reasons, I can acknowledge that the film has issues, while praising its solid production values, solid acting, and genuinely exciting narrative, while also speculating about its value in the years to come. Will a younger generation hold this film as their (fairly intense) childhood joy? We’ll see, but for now, I can simply enjoy it as a fun throwback adventure, with some nice modern touches. Note: Be sure to stay during the credits, as the film does have a wonderfully charming sendoff. Louis: I saw it. No one believes me.